Here’s the deal. Although I never see actual costumes for cats in stores (they are all “small dog” costumes that we force onto our little furry shitheads), there appear to be plenty on Etsy, and a lot of hilarious ideas online. So here is my idea for a kind of cat costume that the world really needs, and not the ones it is providing to me, a lover of cats. As a purebred catlady, I know that cats have strange personalities. Some, like my Tuff Ghost, you can never touch, let alone costume. Haircut lets anyone put anything on her, which is why I make her use the buddy system when going out. Olive decides in each moment what she wants to do, and it is never predictable, although you can definitely predict that she will not want to dress up as a dragon (again). But this idea is probably good for any cat that would allow traditional cat costumes, or maybe even just a harness. Not in a pleasing way of course, but because it will be impossible for your little darling to shake it off. I am always yelling at these cats to get a job. They live in my house rent-free and eat the food that I buy them. They tear up my couches and pee on them too. Then they expel hairballs around the living room. My point is that they need a job, but no one will hire them when they wake up at 1 pm and then drag their feet until I get home to feed them dinner. If they could just help out a little, or just clean up after themselves, the world would not only be a much better place, but so would my apartment! The most common messes that cats leave are hair everywhere all the time always, floating around and gathering on the floor. Also, things that they knock over, which are probably covered in hair. Also hairballs. And hair on the furniture. 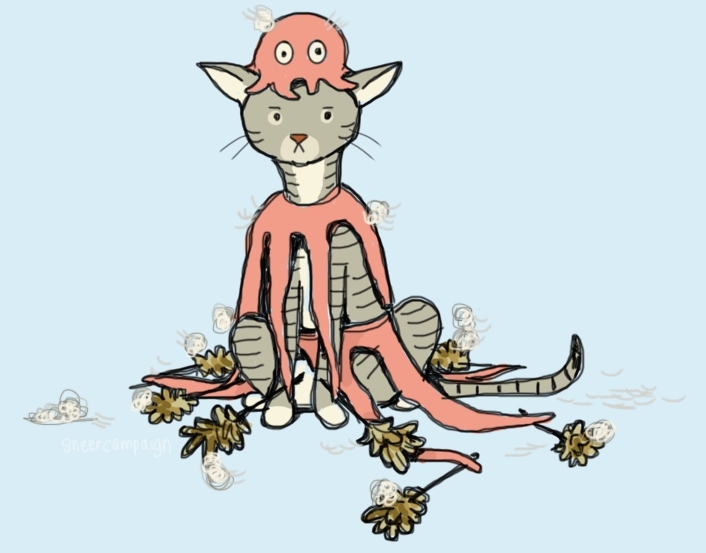 Now my cats can mop the floor with their tentacled clothes, making them both helpful and responsible. If anyone wants to borrow my octo-cat, maybe she can even pay rent soon. Now, how do I make that? Previous It’s Time for Yo Garbo Garbo!